Sean Wolfington is a technology entrepreneur in the automotive, real estate and film industries. Wolfington built and sold 6 digital platform companies that enabled the sale of over 2 billion dollars of vehicles over the internet. These automotive technology companies have worked with 16 automotive manufacturers, 76 of the top 100 dealer groups, and over 5,000 retailers in 18 countries. 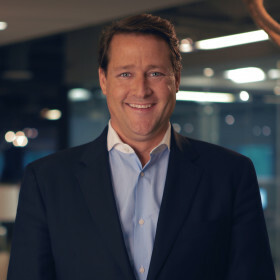 Wolfington is the founder, chairman and CEO of CarSaver, a mobile auto buying platform that is Walmart’s exclusive partner for auto sales, finance and insurance. CarSaver helps Walmart’s 250 million customers use their mobile phones to shop, buy, finance, lease and insure all brands of new and used cars through their network of dealers, banks and insurance providers. Wolfington also owns a group of auto-tech companies, including Data Driven Holdings, Team Velocity, Tier 10, Level 5, Social Dealer, Offer Logix, Intellacar and Los Angeles Honda. Six of Wolfington’s companies were previously acquired; Carmercial was acquired by DDH in 2018. Call Revu was acquired by Serent Capital in 2017. Driving Loyalty was acquired by Automotive dealer solutions in 2015. Vin Solutions was acquired by Cox Automotive/ Autotrader in 2011. BZ Results was acquired by ADP in 2006. Automark/Cyber Car was acquired by Reynolds and Reynolds in 2001. Beyond automotive, Wolfington produced multiple major motion pictures including Bella, the Mighty Macs, Self-Medicated, Little Boy and Sound of Freedom. At the age of 34, Wolfington was a finalist in Ernst & Young’s “Entrepreneur of the Year Award”. In 2008, Wolfington was honored with the President’s Service Award, received the Legacy Award from the National Council for Adoption and was honored by Tony Bennett in 2012 with the Tony Bennett Exploring the Arts Award for his support of the arts and children’s education. The Wolfington Charitable Foundation actively supports charities that serve the poor and defend the defenseless. The WCF has also partnered with the Inspiring Children’s foundation to transform the lives of underprivileged kids by providing personal mentorship that builds character and life skills. So far, 118 children from the foundation have received scholarships to institutions like Harvard, Stanford, Yale, Georgetown, Princeton, West Point, the Naval Academy and many others.